This post was sponsored by JSL Foods. As always, all thoughts and opinions are my own. 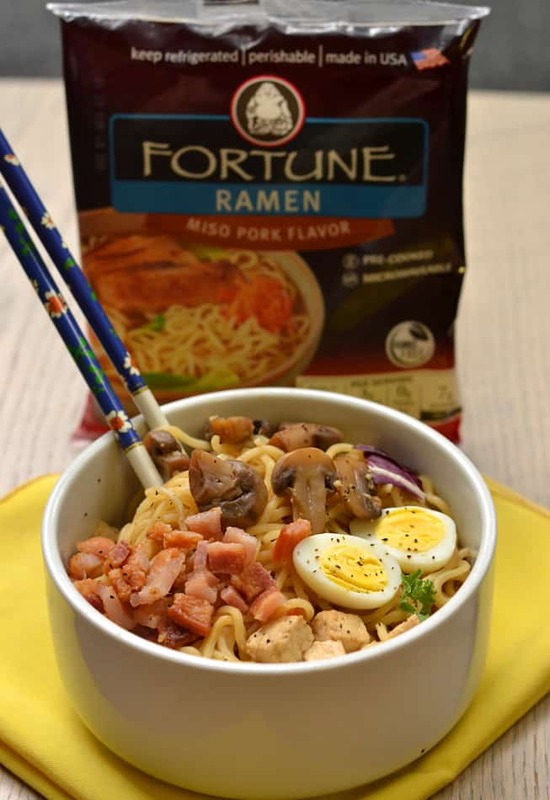 Create a quick dinner with on hand ingredients and Fortune Ramen Noodles! Mealtime doesn’t always need to be over complicated. Part of juggling a never ending busy life is is learning how to efficiently feed yourself & your loved ones without slaving over the stove for hours or ordering takeout. Quinoa, rice & noodles fill the majority of our dinner time menus. These meals come together quickly, keep everyone happy and the options are endless. 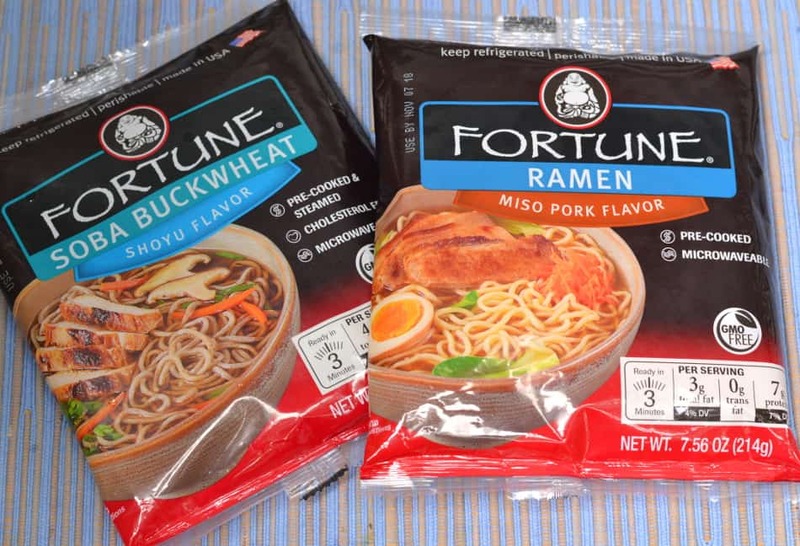 I recently tried JSL Foods Fortune Ramen & Soba Buckwheat noodles. LOVE!!! I ate them plain. I ate them with chicken and veggies. I ate them with garlic chili paste. Each way I tried them – they were delicious. The Ramen noodles are in a Pork Bone Based Miso Soup. 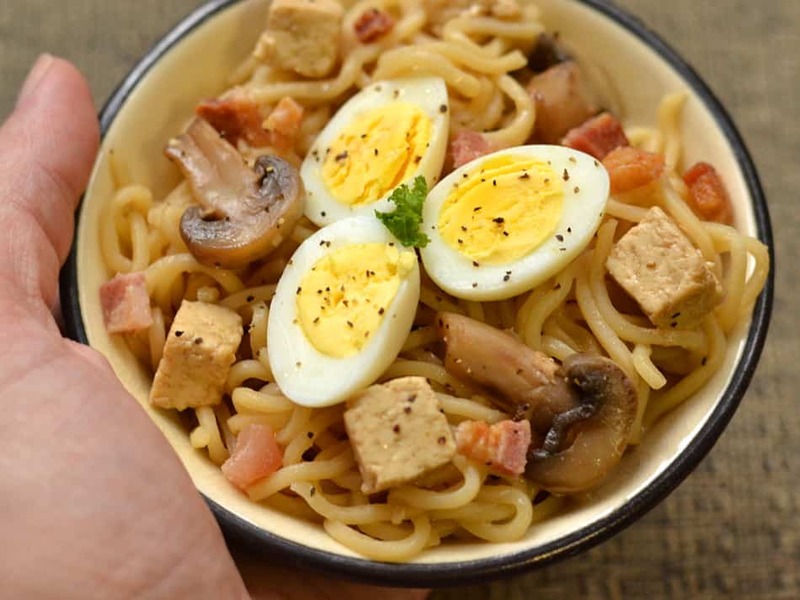 The noodles have great texture & bite to them and the soup is loaded with flavor. They’re welcoming any ingredient you’d like to toss in! 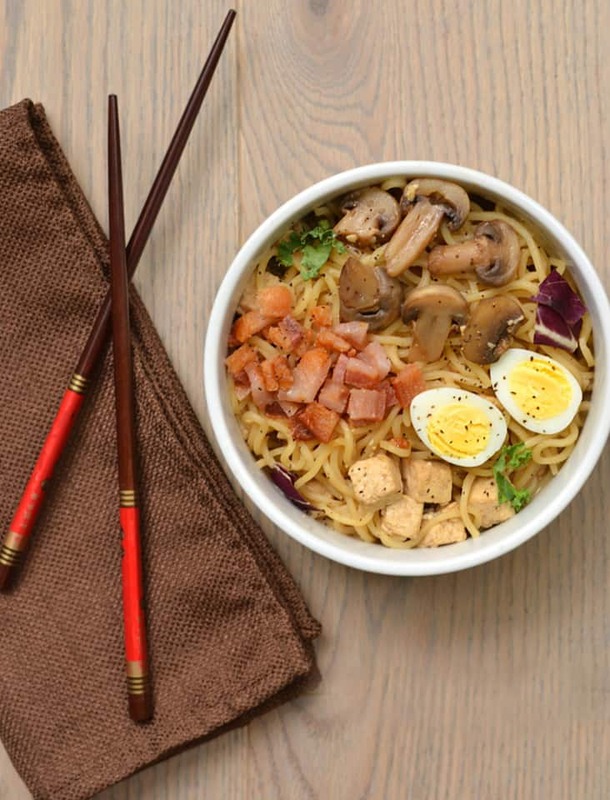 This is not that (yuck) styrofoam cup of dried noodles in a salt bath – this ramen is the real deal. Precooked, all you need to do is heat them up. Throw them in the microwave, a saucepan or skillet and let your imagination run wild. 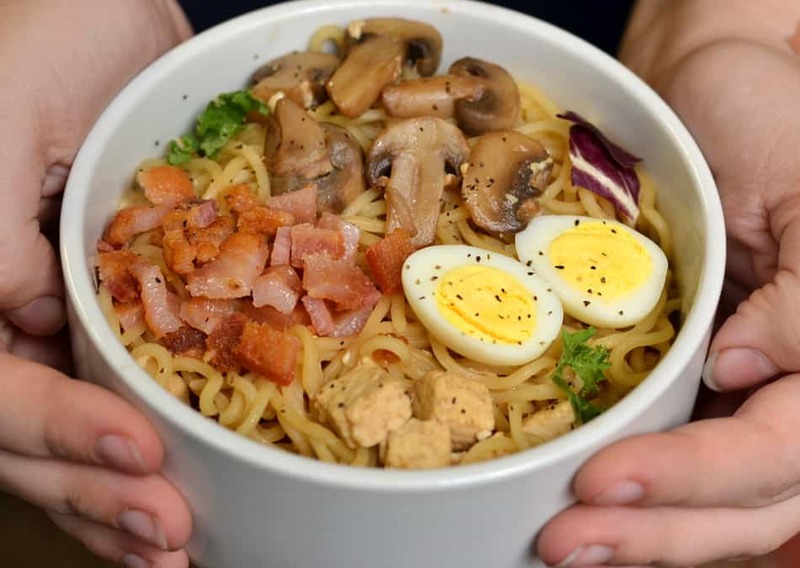 A friend of mine from Japan used to joke to me that ramen was to Japanese as casseroles were to Americans. It could be an occasion to clear the leftovers out of the fridge and create a unique, hearty and tasty meal. That was my simple inspiration for this ramen bowl. Staring in my fridge I saw tofu, salted pork belly & mushrooms that needed to get used up. I heated up the seasoning packet and water, threw in a handful of mushrooms, diced tofu and a few fresh quail eggs. Five minutes later I removed the quail eggs, dropped in the noodles, cooked for a minute and dinner was ready. I added the cooked quail eggs and sprinkled some browned pork belly over it all for some crunch. Yum! Quick, simple and so delicious. 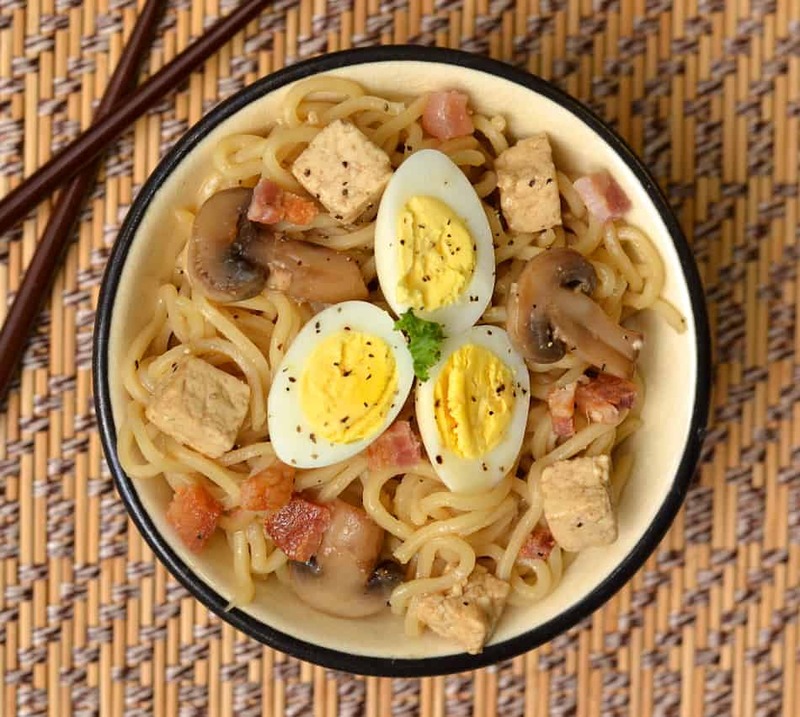 Fortune Noodles make a great meal anytime & anyway you want to make them! You can purchase JSL Foods products at: Shop Rite, Von’s, Pavilions & Safeway. Visit the JSL Foods Website or check them out on Facebook & Twitter!